Casino Tropez has been online since 2001. It is owned and operated by Fastengine Processing Limited and it is licensed and regulated in Antigua and Barbuda. The games are verified by Technical Systems Testing (TST) to be fair and they ensure the safety and security of your personal and financial information. Casino Tropez is powered by Playtech software and is available in a download version and a no download instant play version. The casino supports play in multiple languages, including English, German, Italian, Spanish, Russian, Portuguese, Swedish, French, Polish, Danish, Romanian and others. The casino offers a huge suite of more than 350 game titles. Game categories include 52 card and table games, 15 arcade games, 16 video poker games, 14 scratch card games, 17 live games, 20 Hollywood games, 100 slots games and plenty others. Casino Tropez offers a number of exciting bonuses and promotions, particularly for their new players. 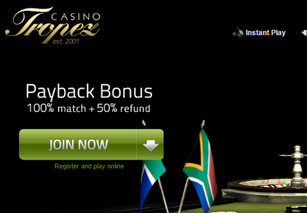 New players are eligible for a 100% match deposit bonus plus a 50% refund that works out to a total of R30,000. There is also a special high roller welcome bonus and a refer a friend bonus if you refer a friend to the casino. Casino Tropez runs a loyalty program called Club Tropez that rewards its loyal players. There are seven VIP levels – Club, Bronze, Silver, Gold, Platinum, Diamond and Premier Club and the higher you climb in the program, the more benefits you will be eligible for. Some of the benefits of the loyalty program include a weekly loyalty bonus, extra exclusive bonuses, faster withdrawal times, contests, elite promotions, deposit deals, increased flexibility on the terms of your account and a personal host or account manager. Players earn comp points when they play for real money and these can be accumulated and redeemed for cash. The more points you earn, the higher you will climb in the VIP program. If you have any questions when playing at Casino Tropez you can access the Help and FAQ sections on their website. These sections contain the answers to many general questions. If you have further questions or require more specific assistance you can contact their customer support team which is available 24 hours a day, seven days a week. They can be contacted via email, telephone, fax or instant live chat. Bank Transfer, Mastercard, Maestro, Visa, Skrill, NETELLER, Delta, entropay, ECO, clickandbuy, WireTransfer, iDebit and more.